Microgaming is a casino software company that has been in business since 1994. Microgaming specializes in designing software for online casinos, of which it has a client list of about 100 online casinos. Microgaming has a portfolio of over 300 unique casino games, making it one of the largest casino software companies. Among its wide range of games is a list of video poker variants that Microgaming has developed over the years. These video poker machines are used at a ton of online casinos because they have proven so popular with casino players. 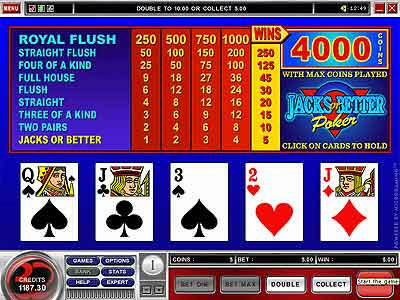 Microgaming offers nine (9) video poker games including the old favorites such as Jacks or Better, Tens or Better, Joker Poker, and Deuces Wild in single hand and four-hand variations. Some Microgaming casinos also offer 100-hand versions of Jacks or Better. Players also love Microgaming's video poker machines because the payout rates are very high. The worst paying video poker game in Microgaming's arsenal pays out 98.10% to players and the best paying video poker machine pays out a whopping 99.54%. When it comes to online casino gambling, this is just about impossible to beat.